On this page you will find a continuously updated list of all events held by the VTI. This transition workshop is open to all honorably discharged veterans, and is a crucial step toward adapting to civilian life. This event is FREE for veterans. Knowledge that speeds adjustment to the business environment. Tools and techniques to successfully transition to the private sector. The course is based on scenarios, case studies, and role plays to provide a dynamic and engaging look inside the business environment. The following program objectives reflect the overarching mission of the program: to develop a new empowerment perpetuating military values into American business for personal and professional success. Present new information that will result in changes in perspective and knowledge of the business environment. Enable students to demonstrate and practice knowledge and new perspectives in tasks, procedures, and handling of policies. Lead veterans to use their new knowledge and skills to leverage leadership, communication and decision-making competencies in business. Click here for the weekend schedule. The transition workshop leader, Lieutenant Colonel Jim Sfayer, USMC (Retired), is a Walt Disney Award-winning teacher and a previous "military expert" for FOX 5 NY. Jim created the VTI course material based on a program he developed in 2006 for transitioning Marines, the Marine Civilian Development Program. 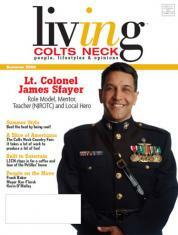 He presented this program for two years to over 500 young Marines and their spouses. Copyright 2010 Veterans Transition Initiative, Inc. All rights reserved.